Mother House is the heart and the headquarters of the General Directorate of the international community of the Institute of the Sisters of Mary. In Schoenstatt, where the institute was born, the founder lived and gave structure to the community. The currents of life of this international family meet here and flow out from here to every place where they are active members of the Institute. The Mother House is the home of all the Sisters of Mary. The house is reserved for private use by the Institute. This is where the novices are introduced to the life and spirituality of the community. The house is reserved for private use by the Institute. The house was inaugurated in 1954. This was the first house the Sisters built on Mount Schoenstatt. The Sisters of Mary use this house for tertianship training and spiritual retreats. Here they undergo periods of intensive training after having completed their novitiate. Retreats, conferences and international seminars are also held here. Schulungsheim not only has a special meaning for the Sisters’ community but also for the entire Schoenstatt Family because Fr. Kentenich lived there after returning from his exile in Milwaukee, USA. Pilgrims can visit the study and living quarters he used up until the time of his death and it has been kept just as he left it. From December 1965 to 1968, Fr. Kentenich received many people here and made many important decisions. Blessed on 5 May 1954, this was the first daughter shrine in Original Schoenstatt. After his return from the United States in 1965 up until his death on 15 September 1968, Fr. Kentenich celebrated Mass 567 times in this shrine. This shrine is the spiritual centre of the entire Institute of the Sisters of Mary. Celebrations of course communities in Schoenstatt, such as incorporation into the Institute, jubilees, etc, are celebrated in this shrine. The missionary current among the Sisters of Mary began in 1933. In 1950 a missionary training and coordination centre was created. The house was blessed by Fr. Kentenich in June 1966. Sisters from overseas spend some time in Missionshaus by taking up a field of work, completing their studies or receiving training. Books in various languages can be bought at the bookshop. Pilgrims may also spend the night at the house. It is also possible to visit an exhibition of the work done by Sisters in the early years of their missionary work. Fr. 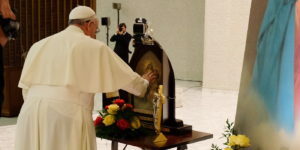 Kentenich and the Family promised to build a church in honor of the Blessed Sacrament if God, though the Blessed Virgin, protected Schoenstatt against the Nazi threat. The fact that none of the houses in Schoenstatt were destroyed by the war is a sign of her protection. In 1960, architect Alexander Von Branca drew up the plans and two Sisters of Mary designed the stained glass windows and interior symbolism of the church. The seven structures in the fountain that can be found outside of the church, upon which the cross is raised, symbolise the Church’s sacraments, the “streams of living water” (cf. John 7:38) that arise from the cross. On the morning of 15 September 1968, Fr. Kentenich celebrated his first and last Mass in the Adoration Church. After the Mass at seven in the morning, he returned to the sacristy and died of a heart attack. A small reddish carpet with the inscription: “the way leads heavenwards” shows us the exact place where he rested eternally. On 20 September his mortal remains were placed in the sarcophagus that was built over the place where he died. Over his tomb are the words that he wished to have as his epitaph: “Dilexit Ecclesiam” (He loved the Church). The process for his canonisation was opened in the Trier Diocese in 1975. Here, in a very special way, we are able to feel something of the founder’s fatherly and prophetic personality. To the left of the fountain symbolising the seven sacraments, pilgrims can enter the chapel belonging to the Adoration sisters. The Sisters have dedicated themselves to perpetual adoration since 1934. They have lived in this house since 1976. Pilgrims are invited to visit the chapel to pray or join in the liturgy of the hours. Inside the house, the sisters have their own shrine (only for use by the community). Visitors to Mount Schoenstatt are invited to enter the coffee shop and bookshop. Visitors can buy a cup of coffee, cake, drinks or a mug of hot chocolate. Books, cards, religious items, CD and memorabilia are available at the “Schoenstatt” bookshop, a branch of the “Schoenstatt Verlag” in the valley. This house was blessed in 1985 for the centenary of Fr. Kentenich’s birth. It was also designed by the architect, Von Branca. The house is divided into four areas, each with a meditative space, corresponding with the four fundamental aspects of Schoenstatt’s spirituality and objectives. Objects, pictures and texts allow the visitor to have a personal encounter with the person of Fr. Kentenich. Among them is the statue in front of which Fr. Kentenich’s mother consecrated the young Joseph to Mary and the life-size model of the bank vault in the Koblenz prison where Fr. Kentenich spent four weeks in solitary confinement (1941). Visitors may buy or borrow a book in English with explanations to the objects and texts in the exhibition. A 15-minute audiovisual program also introduces the visitor to the life and times of the Founder. Located to the left of the Father Kentenich House, the Father Joseph Kentenich Secretariat, opened in 1975, works with the process for the Founder’s canonisation. Intentions and prayers that have been answered through his intercession can be communicated here. In addition to this, information material and prayer suggestions are distributed free of charge or for a voluntary donation. Marienland is the centre of the Dynamic Province, belonging to the Sisters who work explicitly as advisors to the Movement in Germany. In particular, they have taken up the main task of the Institute which is to be, together with the other Institutes and Federations, the soul of the Schoenstatt Movement. Marienland is the centre for the Movement’s women’s circles in Germany, including the professional women’s branch, the mothers’ branch, the mothers’ federation and the federation of the sick. The house also offers its services to other circles within the Schoenstatt Family and various other guests in search of a training house with a religious atmosphere. The training house accommodates more than 200 people. The name “Marienland” (meaning “land of Mary”) can be attributed to Fr. Kentenich whose great desire was that Germany become an increasingly Marian country. The effort of the work team at the training centre can be summarised by the motto: “We want you to feel as if you were at home.” Together with the peace offered by nature, the atmosphere of the house, the choice of service staff, good food and many other qualities, the Sisters aim to create an environment where people can rest and be interiorly renewed. The house and the Regnum Patris Shrine were blessed on 30 April 1977.